The ribbon cutting event celebrating the restoration of a Tarrytown section of the trail drew a happy and enthusiastic crowd on Sunday June 15. The event opened in a spectacular setting in the Lyndhurst conservatory with our special guests sitting beside the fountain with the scent of roses in the air. 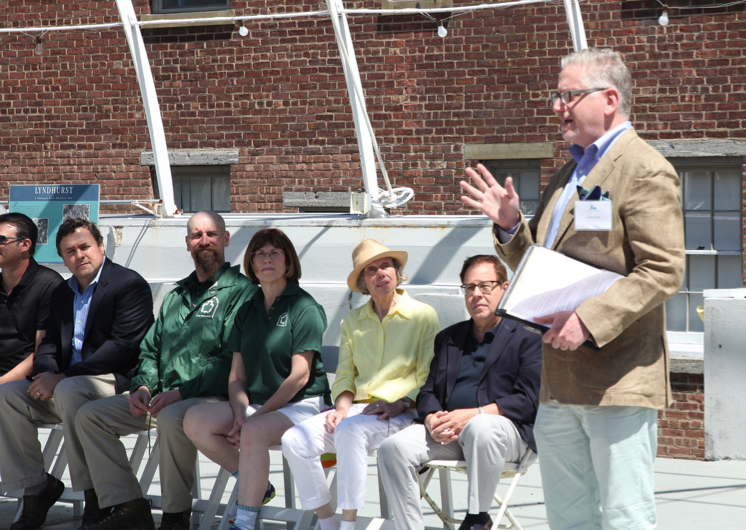 Kevin Plunkett, Westchester County Executive; Assemblyman Tom Abinanti, Westchester County Legislator; and MaryJane Shimsky all spoke glowingly of the importance of the trail to all Westchester residents and visitors. Linda Cooper, Director of the Taconic Region of NY State Parks, Andy Todd and Barry Prevor of Greystone-on-Hudson – who facilitated the restoration of the trail – cut the ribbon together with a signal from FOCA president, Mavis Cain. Two Dobbs Ferry student musicians Phil Moreno and Thomas Horikawa heralded the speeches with a trumpet flare and clarinet melodies as the group walked the trail. Howard Zar, Lyndhurst Director hosted the event.